How about this treat of a recipe from our current Season’s Best Recipe Book?! It actually tastes even better than it looks!!! Who would have thought that a cake cooked in the microwave could taste this good. I do actually think that the Pampered Chef Rockcrok makes the difference with this. The recipe talks about the Everyday Pan but the Dutch Oven will do just fine. Place chocolate chips in (250-ml) Prep Bowl, microwave, uncovered, on HIGH 60 – 90 seconds or until almost melted, stir until smooth. Set aside. Place sugar, flour, baking powder and cocoa powder in Classic Batter Bowl; mix well. In Small Batter Bowl, whisk butter, milk and eggs together until well combined using Stainless Whisk. Pour egg mixture into the flour mixture; whisk together until well combined and smooth. Pour sponge batter into Rockcrok® (2.35-Litre) Everyday Pan. Microwave, covered, on HIGH 5 – 6 minutes or until a wooden cocktail stick comes out clean when inserted into centre of sponge. Meanwhile, preheat a hot grill. Remove pan from microwave oven; arrange marshmallows in a single layer over sponge. Place pan 5 – 10 cm from heating element; grill 20 – 50 seconds or until marshmallows are golden brown. Remove pan from grill. To crumble biscuits easily use a Food Chopper. Sprinkle crumbled biscuits over marshmallows, if desired. Spoon chocolate into small polythene food bag; secure top with Twixit! Clip. Trim a small tip off one corner of bag; drizzle chocolate over marshmallow topping. Serve immediately using Chef’s Tools Spoon. 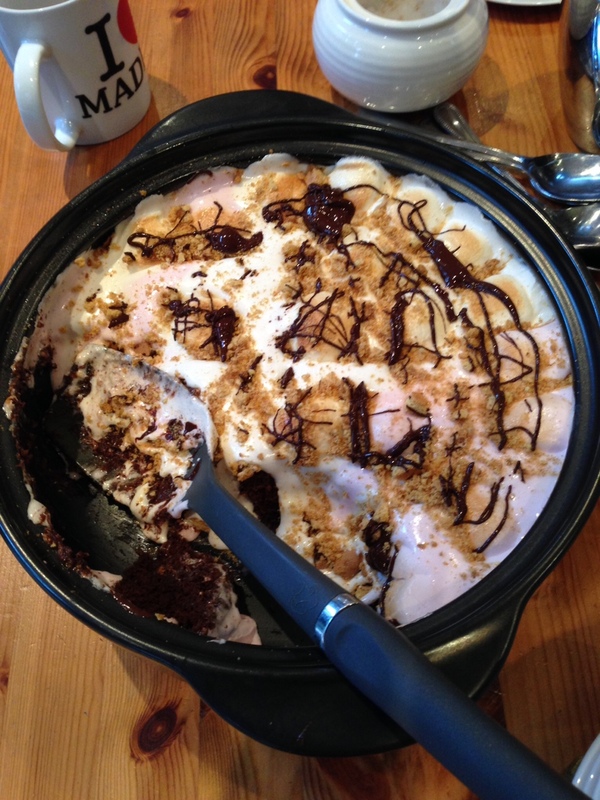 Cook’s Tip: A mix of white and pink marshmallows can be used to top the pudding, if desired. Alternatively, use 100 g mini marshmallows for a slightly less sweet topping. To oven bake: Preheat oven to 190ºC/fan 170ºC/Gas 5. Make sponge as directed in step 2 and 3, but oven bake, uncovered, for 25 – 30 minutes or until sponge is fully cooked. Remove from oven. Preheat a hot grill. Melt chocolate as directed in step 1. Arrange marshmallows in a single layer over sponge and finish as recipe directs. This is a really gorgeous cheesecake from Amanda one of my fabulous Pampered Chef colleagues (though she isn’t sure where she got it from!) via Belinda who raved about it until I tried it!! As always its also very easy to make. Chop biscuits using Food Chopper. Melt butter in Large Micro Cooker in the microwave – takes about 1 1/2 minutes on medium – check after every 30 seconds though! Soften cream cheese in Small Stainless Bowl with Small Mix n Scraper. In Classic Batter Bowl whisk the cream using Double Balloon Whisk then add cream to cream cheese and sugar mixture. Add the optional vanilla extract/paste and combine. Break up Toblerone and melt in microwave in Large Micro Cooker. Do this at medium heat and check every 30 seconds. Should take approximately 1½ minutes. Fold into the cheesecake mix to combine as thoroughly as possible then put into springform pan. You could add a little Bailey’s to the mixture if you like too! Some tell me they like to serve this with cream but I think that’s gilding the lily a little too much personally! 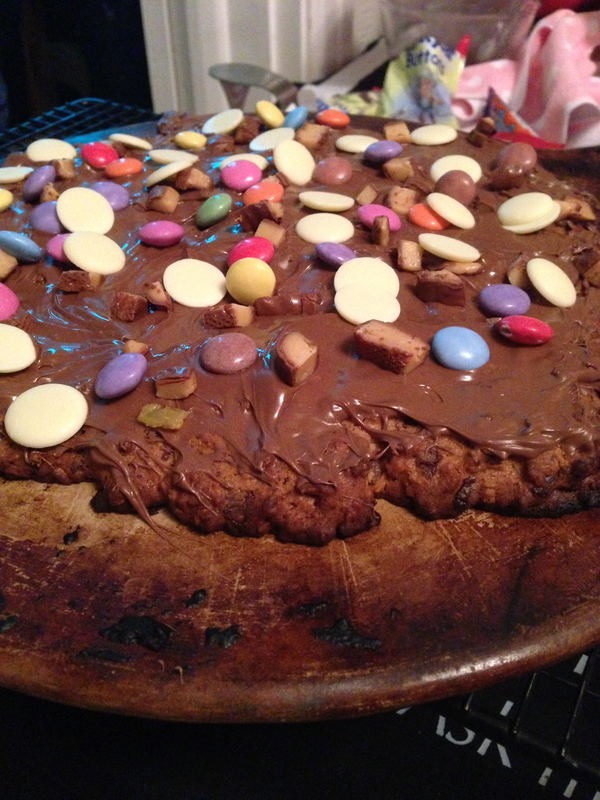 This is a fantastic ‘pizza’ as a pudding. It tastes really delicious warm (so far I haven’t managed to eat any cold because it gets eaten to quickly!). As always with Pampered Chef the recipe is quick and easy. This is also the find of recipe that kids will love to help make and then help eating later of course! 1. Preheat oven to 180oC or gas mark 4. 2. Lightly spray Medium round stone with Kitchen spritzer, set aside. 6. shape the dough into a ball and place on the medium round stone, roll into a large circle using the bakers roller. Filed under Batter Bowl, Chocolate, Eggs, Food Chopper, Medium Bar Pan, Medium Round Stone, Microplane Grater, Stoneware, Super Quick cooking! This is a fabulously easy recipe for holiday (or any time!) baking given to me years ago by my lovely friends Sarah!! Don’t be tempted to overbake or they will dry out (though I still manage to eat them OK!!). This is a recipe my daughter’s love making as it doesn’t have many steps, so I have done the whole recipe with photos to make it as easy to follow as possible. Preheat oven 180C/ Gas 5. Add Butter and Sugar to Saucepan and melt. Pour into Medium Bar Pan. These really are fudgy brownies and very, very simple. As I made this at my show yesterday someone commented that I just ‘bang’ the recipe about and didn’t bother about “folding” and “light stirring” and “looking after all the air”. It really isn’t needed with this recipe at all!! 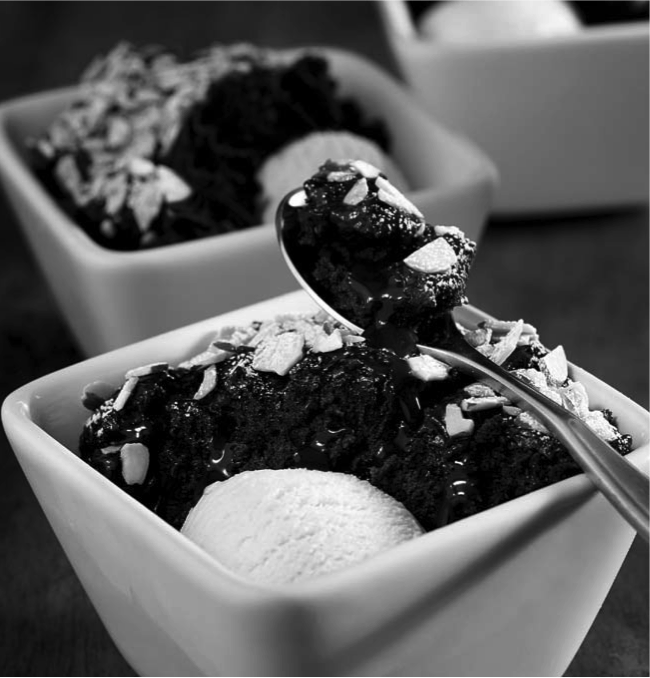 The Salsa tastes absolutely fabulous with the brownies, especially when they are served warm! My top tip for making the Brownies (this is true of all brownie recipes) – DON”T be tempted to keep them in the oven even if they don’t look totally cooked. 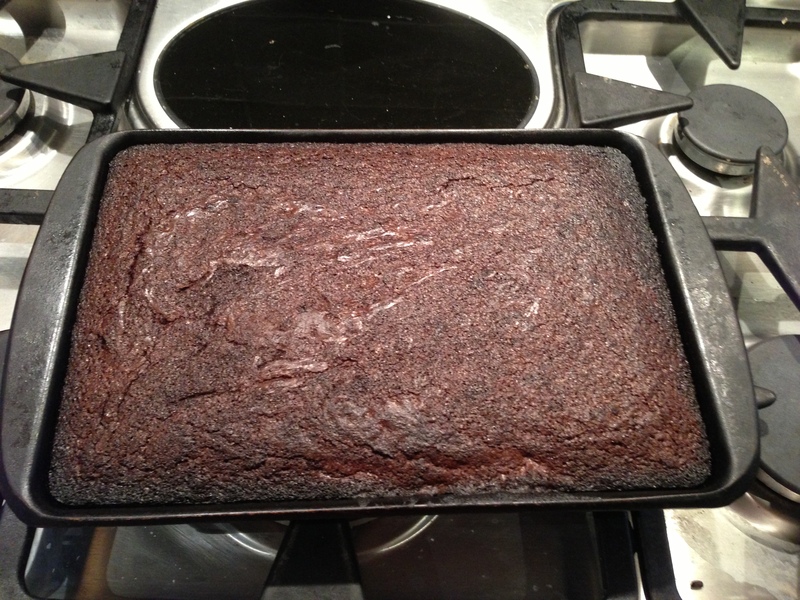 Its easy to ‘overbake’ brownies and end up with tasty but dry rather than fudgy brownies!! Preheat oven to 180C / Gas 4. Spray bottom of Medium Bar Pan with vegetable oil using Kitchen Spritzer. For brownies, in Classic Batter Bowl, combine sugar, flour, coca powder and salt; mix well. In Small Batter Bowl, whisk eggs and milk until blended using Stainless Steel Whisk. Add eggs and milk to flour mixture together with melted margarine; whisk until well blended and smooth. This luscious salsa is the perfect accompaniment to chocolate brownies! Cut apples into quarters; chop using Food Chopper OR chop using Manual Food Processor. If using Manual Food processor add all other ingredients except strawberries (using Citrus Press to juice the orange) and lightly mix. Hull strawberries with the Cooks Corer and slice with Egg Slicer Plus. Add strawberries to sales and serve with brownies. If using Food Chopper, add apple and all other ingredients except strawberries (using Citrus Press to juice the orange) to Small Batter Bowl and lightly mix using Small Mix ‘N Scraper. Add strawberries and serve with brownies. 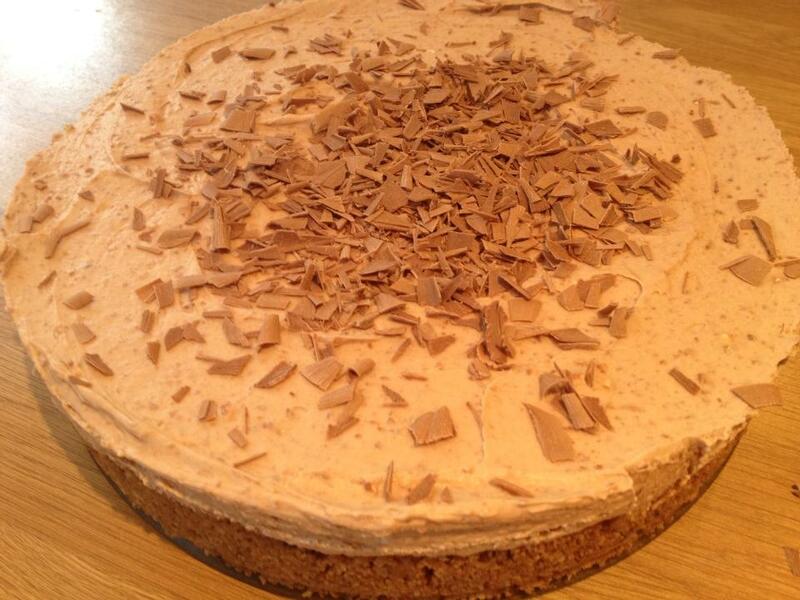 Serves 8 greedy people as a dessert or up 24 as a gentile taste! This chocolate cake recipe was given to me by my lovely friend Anne. It is perfect for the Rectangular Stoneware Baker and for making a large cake for a big occasion. The topping is an adaptation of a couple I have seen floating around Facebook. So very, very easy, its almost feels like cheating!! Beat the butter/marg and sugar together until light and fluffy. Add eggs slowly and beat. Fold Flour and Cocoa in. Put mixture into Rectangular Baker and smooth top a bit. 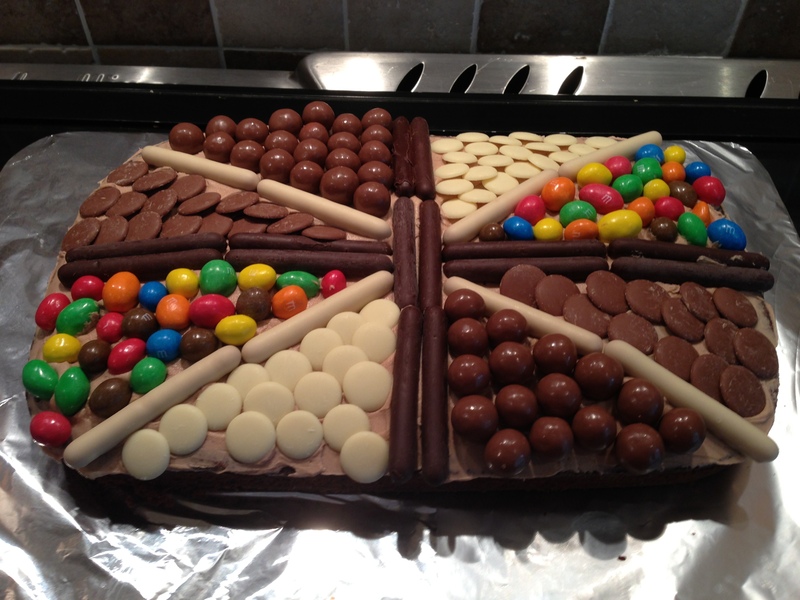 Cook for 40 minutes or until cake tester comes out clean. Leave to cool before attempting icing. For the icing combine Butter and Icing Sugar in Batter Bowl until fully mixed. Add cocoa to taste. Spread over cake using Small Spreader.